This blog post is not about Charley. It’s not about a boy with Duchenne. It’s not even about a boy. It’s about a woman. But because it’s about her, it’s about every baby, every child and every young adult with Duchenne. Laura Dalle Pazze is the Chief Operating Officer of Charley’s Fund. In short, she makes everything we do happen. If you’ve never heard Laura’s name, that’s because she’s often working behind the scenes, strategically planning and expertly executing our initiatives. Here’s a peek at Laura’s October calendar to give you inkling of what I mean. First she was in Cambridge, MA to meet with a couple of biotech companies to advance our collaborations. Then she went on to Paris to host “Of Mice and Measures,” a workshop she spearheaded to help improve how we decide which new treatments should advance to clinical trials. Next stop: Silver Springs, Maryland for a meeting with scientists and FDA officials to figure out how we can use data we already have to make clinical trials faster, less expensive, and more humane for the kids who have to participate. She’ll close out the month in NYC with the 2017 Race Against Time, our annual community fundraiser that she oversees with equal parts hyper-organization to make sure things run smoothly and fun flair to make sure everyone has a blast. If you’ve been following Charley’s Fund over the past few years, you’ve probably noticed an increased sophistication in the way we approach our mission. We have diversified our portfolio of investments in DMD research. We’ve increased our hands-on help to ensure those shots on goal have the best chance of success. We’re now also anticipating and tackling roadblocks that slow the development of new treatments across the field. Much of that evolution is due to the perspective and experience our COO has brought to our organization. She came to us three years ago from The Michael J. Fox Foundation for Parkinson’s Research, where she spent years contributing to its growth from entrepreneurial start-up to internationally recognized medical research powerhouse. 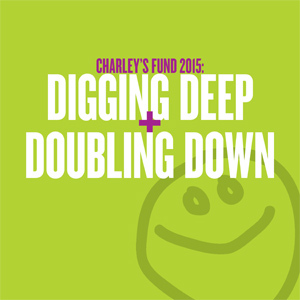 Charley’s Fund has benefitted beyond measure from Laura’s expertise, skills and smarts. But it’s also her passion and dedication that drive us to get better and better at what we do. No challenge is too daunting, no hour is too late. She does not stop! You might view my Tedx talk or read about me in People and think “How does she do it?” Now you know the answer: a woman named Laura. If you haven’t gotten a chance to meet her, drop her a line at laura@charleysfund.org. She’s a real sucker for gourmet chocolate chip cookies, so if you know of a coffee shop or bakery that excels in that area, no doubt she’ll be thrilled to meet you there!